Teens got to examine and identify real birds. Written by Teen Leader, Sean Dooling, of Open Minds Teen Science Café in Whiteville, NC. 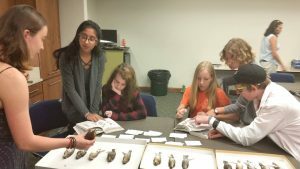 Three members of the Young Naturalists Club (YNC), from the Wake Audubon Society, along with their mentor John Gerwin, Curator of Ornithology at the NC Museum of Natural Sciences (NCMNS) in Raleigh, presented an engaging talk on their work observing birds around the world. The three “bird nerds,” twin sisters Olivia and Vanessa Merrit, freshmen at NC State University, along with their friend Emma Little, a senior at Enloe High School, gave individual PowerPoint presentations on how they grew to love studying birds, and why their interest in birds turned into more than a hobby and became a possible career choice. With the motto, “We Go Outside,” the three teen researchers, along with other members of YNC, spend their spare time trekking through the woodlands of North Carolina. In addition to that, when school breaks, they spend their time traveling abroad to Spain and Nicaragua analyzing various avian species. Over several years, each has acquired specialized interests. Vanessa’s favorite species is the Brown Thrasher Nuthatch and she spoke on that; Olivia is interested in horticulture and enjoys identifying eggs at NCMNS and she presented and showed the teens a variety of eggs; and Emma is intrigued by the ethereal qualities of the ‘double voice box’ song of the Hermit Thrush. 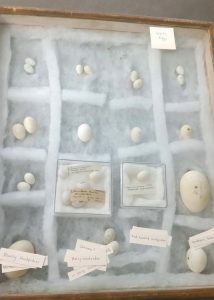 Teens were able to see the different types of eggs of birds as well. Not only did they share their experiences, but they encouraged the teen audience to maintain their curiosity, no matter what scientific discipline they want to pursue. They also advocated studying abroad, and immersing yourself in your passions. For more information on getting involved with the Young Naturalists Club, check out their website. 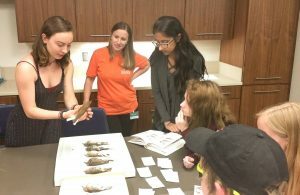 Olivia, Vanessa, and Emma organized and led three stations where teens could gain hands-on experience in bird species identification, egg identification, and the handling of equipment used for bird tagging and tracking.